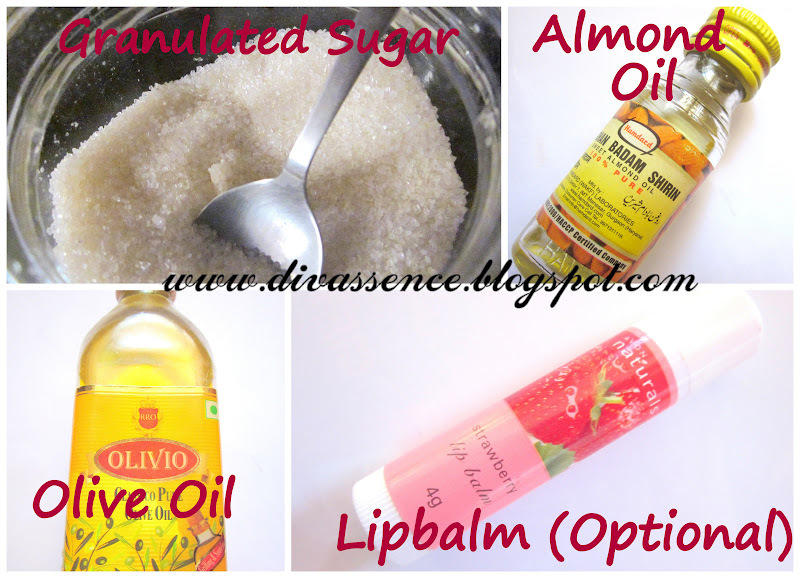 DIY Lip Scrub :D - Divassence! I had posted this picture (the one below) on the Divassence Facebook page for the article on lens case. There was a lot of response for the use of lens case for the purpose of storage (You can read the post here) but a lot of you had also asked me to do a post on the lipscrub. So finally here I am with a DIY post! Almond Oil and Olive Oil: Acts as a base to bring the sugar granules together and gives the lipscrub the perfect consistency. These two oils also nourish your lips and make it easier to spread the scrub on your lips. Olive oil also conditions the lips and is a boon for dry chapped lips. Preparing this isn’t a big deal at all! All you need to do is take a bowl add a little olive oil and almond oil and then add the granulated sugar to the oils but make sure the sugar doesn’t dissolve in it. The quantity of sugar added must be greater than both the oils combined (i.e if you use a teaspoon of olive oil and a teaspoon of almond oil make sure to use 4-5 tsps of sugar or more). There isn’t any fixed proportion for the ingredients. Its upto you to customize it according to your needs. If you want to use a lipbalm add it to the oil mixture before you add the sugar. Use ghee on your lips every night before going to bed. Ghee is richer than olive oil and makes your lips soft. Always keep a small toothbrush (the ones kids use) in hand. Every morning when you brush your teeth lightly swirl this brush on your lips and remove dead skin and apply lipbalm immediately. This lipscrub can be used twice a week. If you dont find it too harsh on your lips then you can use it on alternate days. Don’t forget to use a lipbalm after this. Apply the lipscrub and massage it wth your finger for 2 minutes and then using a small toothbrush gently scrub your lips in a swirling motion. Don’t forget to store the lipscrub in your refrigerator. This will prevent the sugar from dissolving in the oil or melt in the heat (Yes! it is 39 degrees Celsius in Chennai!! :P). Also this will guarantee that your lipscrub stays fresh for a long time. ← Summer, Divassence and Kyra! Fashion Panche – Sparkling Summer Giveaway. Few days left! Hurry up!!! 🙂 yep do try it out! it looks so yum yum Deepika… 😛 You are tight! I might just want to eat it 😉 btw doesn’t it melt later?